This scalable, co-creative, large-format frame loom was designed to be portable to create large collaborative works. The loom has been used by the public at libraries, on the streets of Spartanburg County, and even at the SCLA Conference in Columbia, SC. The collaborative loom was inspired by the region's deep textile history, and during Spring 2017, the loom lived at the Inman Library, one mile from the Inman Mills, founded in 1901. 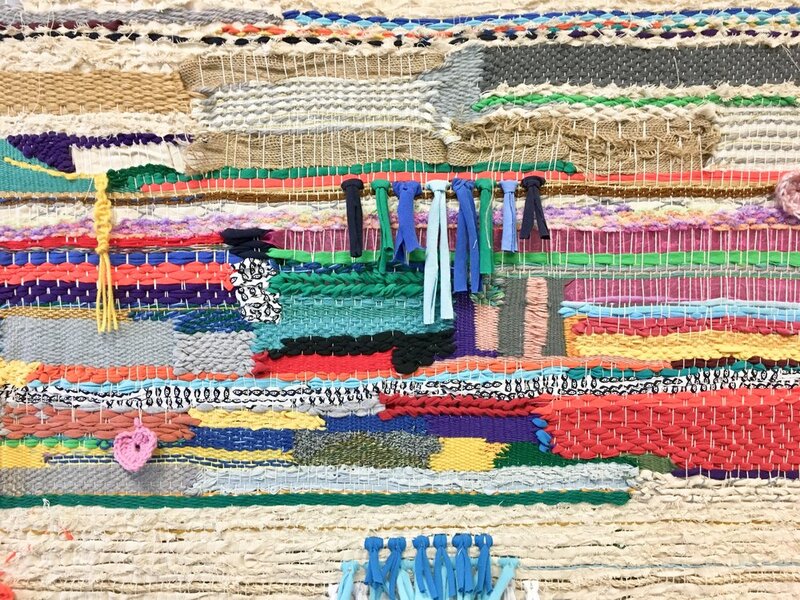 The Inman community collaborated to create a woven wall hanging for the Library (above) using yarn salvaged from a recently closed mill in Hendersonville, NC, and bits of their own fiber material from home. Loom with a View was designed and fabricated in September 2016 during the Artist in the Community Residency in Partnership with HUB-BUB and Spartanburg County Public Libraries by Lydia See and Eli Blasko.